Posted on Sat, Jan 28, 2012 : 12:02 p.m.
Well, you likely know the rest. For the past two seasons, Ohio State has won at least a share of the Big Ten's regular season crown, and entered the Big Dance with a Big Ten Tournament championship trophy under its arm. Right now, anyway, Ohio State is 'the man.' And if the Michigan basketball team wants to be a serious contender this season, all roads run through Columbus. The 20th-ranked Wolverines (16-5, 6-2) seek their first road win at No. 4 Ohio State (18-3, 6-2) since 2003 on Sunday (1 p.m., CBS). And, more importantly, first place in the Big Ten standings is on the line. Michigan sophomore Evan Smotrycz can create a matchup problem for Ohio State. If there's a game that Michigan needs Evan Smotrycz to return to his late-December double-double personality, it's this one. When Smotrycz is playing with energy, defending inside and knocking down 3-pointers, Michigan is a very, very tough team to check. If Michigan gets a tuned-in Smotrycz on Sunday, it can really create matchup issues with a small lineup of Trey Burke, Stu Douglass, Tim Hardaway Jr., Zack Novak and Smotrycz at the five. When he's right, he's tough to check. And if he's sticking 3-pointers at the five spot, Jared Sullinger has to wander out to guard him, which creates about 280 pounds of open space in the lane for Burke to work. Smotrycz showed signs of life against Purdue on Tuesday, hitting a 3-pointer, showing some of his new post moves and finishing with 10 points in 15 minutes. If Michigan can get 25-30 minutes from an energized Smotrycz, its chances of winning increase exponentially. Few coaches in the country are as good at giving multiple defensive looks as John Beilein. When Michigan is really locking in on defense, and really making teams look silly, the Wolverines are doing so by executing man-to-man, 2-3 and 1-3-1 zones whenever Beilein brings them out of his pocket. The beauty of Beilein's reputation as a 1-3-1 coach is that teams have to prepare for it, even if the Wolverines only use it sparingly. Because, with Beilein, you never know -- it could be one possession of zone, it could be 20. Michigan generally throws out multiple looks throughout the course of a game, but against a team as good as Ohio State, it's a necessity. If the Buckeyes get comfortable in any way, Michigan needs to switch things up and do so quickly. William Buford (44) can hurt teams inside and out, but has had bouts of inconsistency throughout his career. Jared Sullinger is likely going to get his against Michigan. To a degree, there's really no getting around it. The Wolverines can do an admirable job of trying to limit Sullinger's impact, but even so, he's still likely to have a solid day. That said, Michigan has to find a way to really clamp down on either William Buford or Deshaun Thomas. 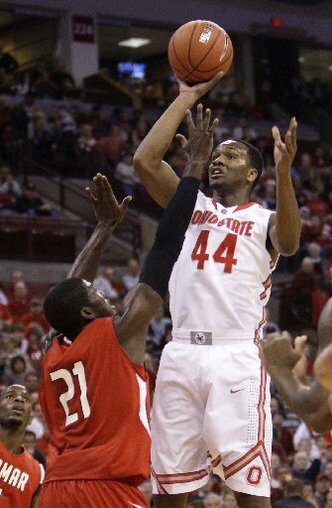 Sullinger's tough enough, but if Buford and Thomas have big nights, Ohio State will win this thing in a laugher. Buford (6-foot-6, 220 pounds) can hurt teams inside and out, but has had bouts of inconsistency throughout his career. Thomas (6-foot-7, 220 pounds) is as talented as any wing in the conference, but had issues playing within himself last season. So, if you're Michigan, pick your poison here. Choose one, and get it done. Because if both Buford and Thomas roll, along with Sullinger, the Wolverines (and pretty much any other team in America) have little to no chance. In order to beat a team as good as Ohio State in its own building, everyone on your roster has to play to their potential. And someone has to go above and beyond. When Illinois knocked off the Buckeyes earlier this season, Brandon Paul went out of his brain for 43 points. Against Kansas, Ohio State felt the wrath of Tyshawn Taylor, who shook off substantial knee pain to hand out a career-high 13 assists. And when OSU fell at Indiana, Jordan Hulls was terrific -- going 4-of-5 from downtown while helping the Hoosiers turn Buckeye point guard Aaron Craft over six times. This is a major rivalry, on national television, with a first-place spot on the line. It has the potential to be a star-making game for someone. Sun, Jan 29, 2012 : 4:26 a.m.
We will beat the spread on this one. Mon, Jan 30, 2012 : 1:19 a.m. Sat, Jan 28, 2012 : 7:58 p.m.
Way to bring the goods Nick. Sat, Jan 28, 2012 : 7:14 p.m. The reason Evan Smotrycz isn't effective in the Big Ten because he needs time to get his shot off. I watched a lot of UM games vs. non-conference foes, and he looked like an All-American. Big Ten teams play tough defense, and they cause him to either hurry his shot, or, not get if off at all. He needs to work on his release now and during off season.